My intensions start out well enough- a trip to the garage to do some Jensen stuff. Soon however I become side-tracked by other hobbies, other problems and space issues. Too much stuff! I've finally admitted I have a problem with vintage Italian racing bicycles (there, I've said it! ), I've hung them all up now I'm moving on to bigger and better things. 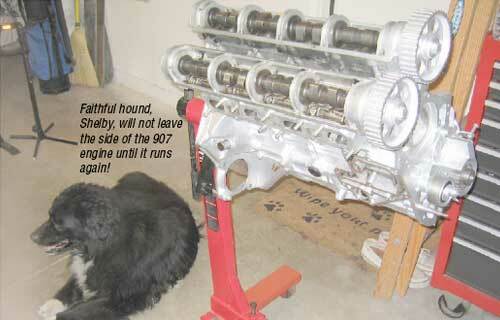 I gave the trusty machine shop a call to see how my 2.2 liter engine is doing. The parts appear to be resting comfortably where I left them last year, so no problems with anything too sudden about to happen. My fault, as I did say "take your time". Unfortunately for me, I have some completely new priorities to face this summer and the 2.2 is no longer at the top of the heap. This had me thinking one recent weekend as I was cleaning up the garage, in preparation for that new burst of Jensen Healey restoration energy that is sure to creep up on me at any time. While hanging up bikes I kicked something very heavy and noticed a small pool of oil on the ground. Oil on the ground can mean only one thing! A British engine is close by! I completely forgot about my original Lotus engine from 13242. Out it comes and hey, it looks good. I can see that cam lobes have almost no wear on them. What would I expect with only 27,033 documented miles. Hmmm, the previous owner did say it was running fine- I know, I know, they all say that, but since he gave the car away, he would have no reason to lie. I could just adjust the shims on this thing, change the front and rear main seals and we'll be driving this puppy to Duke's Big Kahuana bar by the end of the summer for the celebratory Mai Tai. Well, I can dream, can't I? My box of parts (and bumpers) waiting to be powder coated is languishing at home for transportation. The old Land Rover is still at the Auto Body place getting a bazillion dollars worth of new parts and body work since last month's accident when crazy-person-from-a-foreign-country-with-no-insurance ran into it.